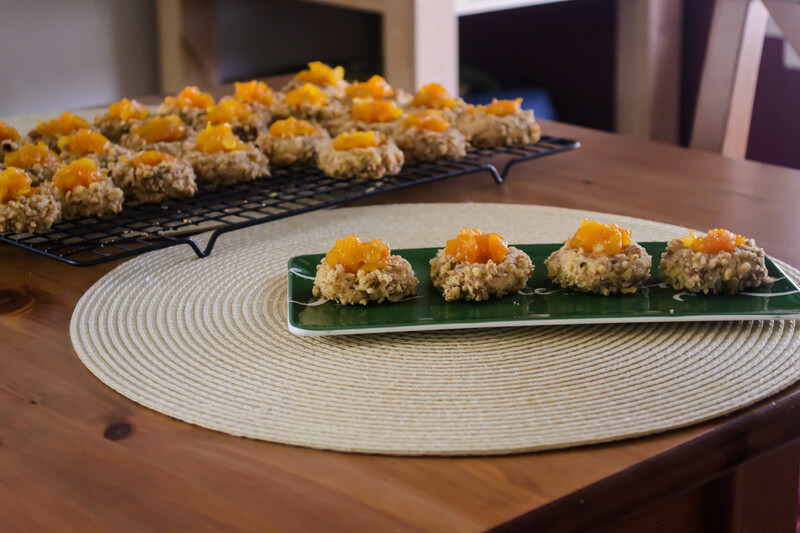 Apricot Ginger Thumbprint Cookies | "blackberry-eating in late September"
Up until I was in college, almost every year my family received a heavy box a week or two before Christmas. As soon as we tore through the tape we could smell them: Nana’s cookies. Ladylocks or cream horns, nut-rolls, pizzelles, thumbprints, sometimes chocolate dipped apricots or seven layer bars; everything nestled in its own individual wrapping and ready to be devoured. And she didn’t just send them to us, but to the families of her other two children as well, and who knows who else. I’m sure she saved a few for herself and Pap – who was quite the cookie fiend – to eat as the holidays approached. I never thought about it when I was a kid, but this must have taken her weeks to do. I can only imagine the organization that went into it – I’m sure dough was made ahead of time and frozen until she was ready to bake, and what a baking day(s) it must have been! How many cookie sheets would that be, all rotating in and out of the oven? How many measuring spoons and bags of flour and sugar and butter? I had big plans this season. I was going to give you with a week of cookies, presenting my favorite holiday offerings with which you could grace your own dessert bar (and if you have one of those, I politely demand to be invited over). Just one cookie recipe a day, and you and I would both be set for the whole season. Alas, as usual, that whole having a day job thing took over. Amidst the stacks of papers, however, one cookie managed to sweet talk its way through: a modest tray of thumbprints that, offered up in my department’s mailroom, disappeared in less than two hours. My people are cookie people. Thumbprints were always included in Nana’s Christmas cookie box. 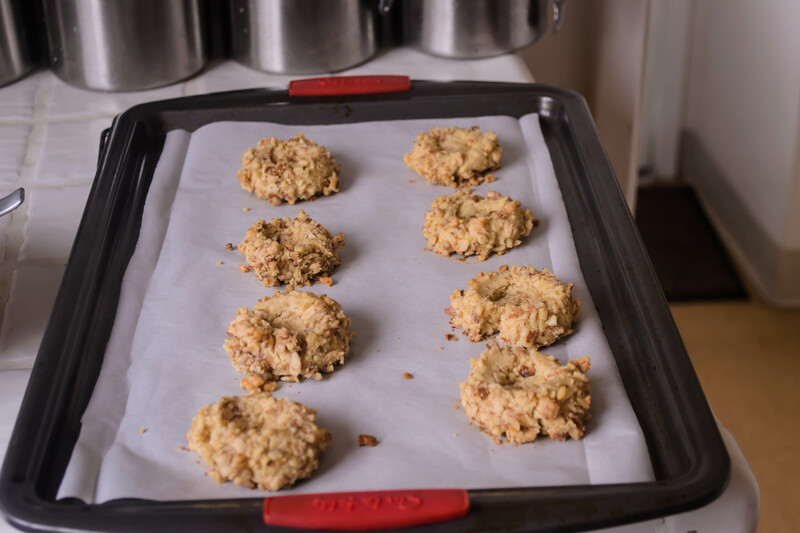 Somewhere between a sugar cookie and shortbread, but with brown sugar rather than white, the soft dough gets rolled into a ball, dunked in egg whites and then coated in chopped nuts. A gentle squash in the middle of the ball gives the cookie its name, and provides a little receptacle for more sweetness – after baking, Nana always filled the little cavity of the cookie with pink or blue royal icing. 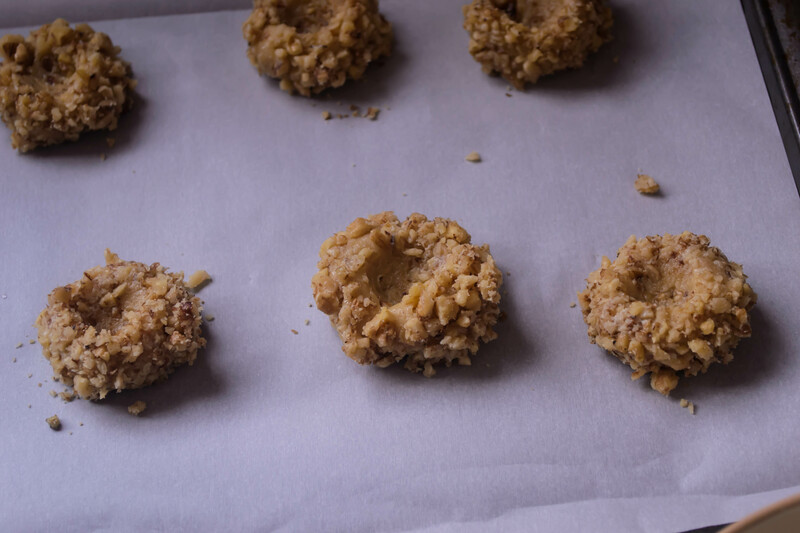 I hadn’t thought about thumbprint cookies in years, but at some point this summer, something reminded me of these pretty little sweets and I knew I wanted to make my own version. None of my relatives – good bakers all – had a copy of Nana’s recipe, but one of my aunts told me to start with Betty Crocker, and gave me a few hints about how Nana might have adapted her version. In mine, I’ve replaced the margarine I’m almost sure Nana used with butter, and gone with a fruit-based jammy chutney for the center rather than the sweet icing she favored. Apricot and crystallized ginger, chopped fine or pulverized in the food processor, cooked down with some water, some sugar, and some lemon zest create a beautiful glossy compote reminiscent of those tubs of candied fruit that show up in grocery store produce sections this time of year, but with fresher, cleaner flavor. It has been a long time since I tasted one of Nana’s thumbprints, but my first bite of these, still warm from the oven, told me I was close. The cookie itself is buttery and crumbly, both features enhanced by its walnut coating, and not overly sweet. 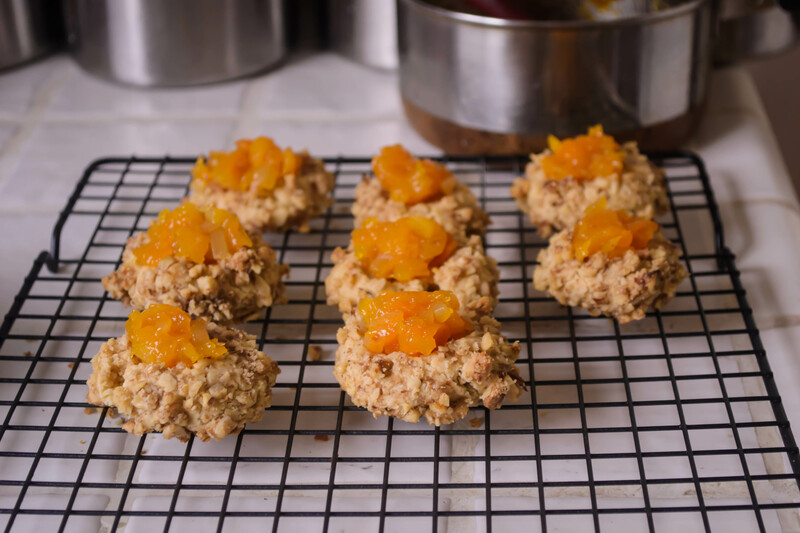 The apricot and ginger filling give it a spicy-sweet character that went as well with the walnuts as I’d hoped, and they are actually tastier the day after baking. 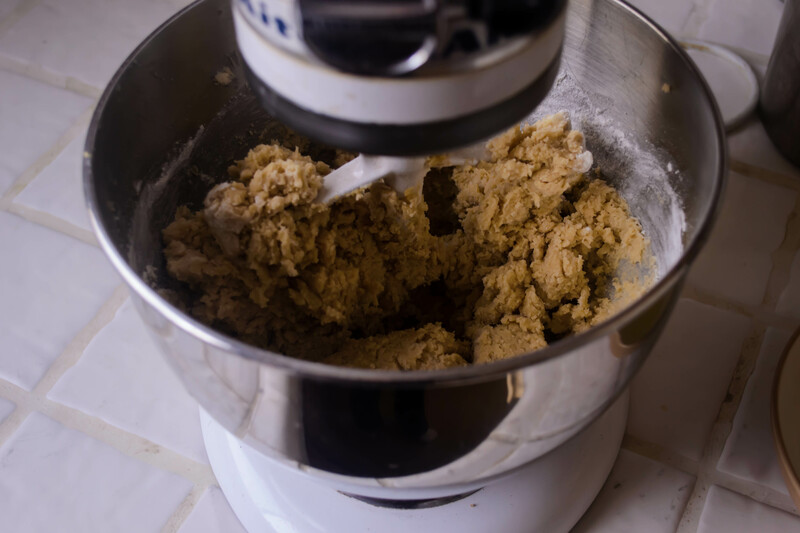 My recipe wound up making a mere 2 ½ dozen cookies, which doesn’t sound like a pittance, but when I brought home an empty tray after making my offering at work, N. and I wished we’d saved more than the four cookies I’d laid aside for us. As a friend shocked me by revealing last night, it’s only ten days till Christmas, and Hanukkah starts tomorrow already. I hope your plans are going well, and if you do have the urge to bake something sweet for someone you love, this little gem of a cookie should be hard to resist. Make the filling first, since it will need time to cool after cooking. With a sharp knife or a food processor, chop the apricots and ginger until very fine. 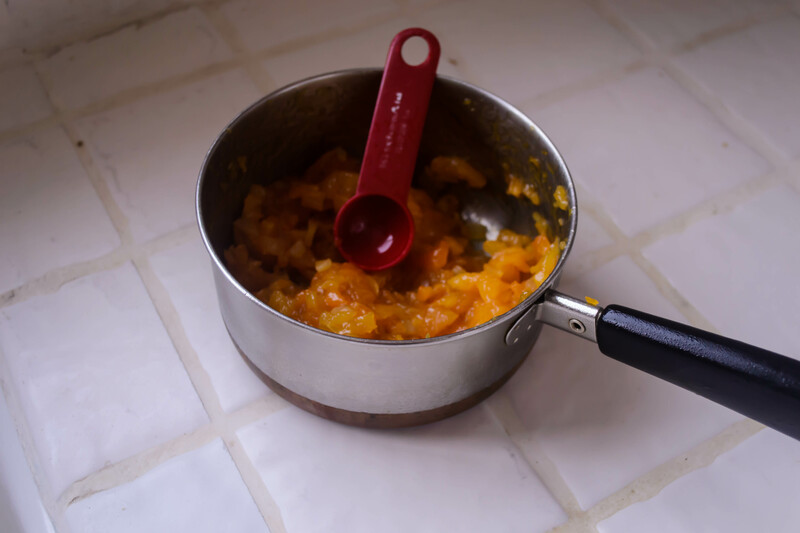 Place apricot and ginger bits in a small pot with lemon zest, water, brown sugar, and the pinch of salt. Bring to a bubble, then reduce heat to medium-low and simmer until the mixture becomes thick, 15-20 minutes. Stir occasionally. When mixture is a thick, jammy consistency, remove from heat and set aside to cool completely. While apricot ginger mixture cools, preheat the oven to 350F and make the cookie dough. Cream the butter until light and fluffy – about 2 minutes. Add the brown sugar and cream together another 2 minutes, until this, too, is light and fluffy. Add the egg yolks and vanilla, and mix well to combine. Sprinkle in the flour and salt, mix well to combine into a clumpy dough approximately the consistency of wet sand. If at this point the dough is too soft to work with, stow it in the fridge for 15 minutes or so to let the butter harden up a bit. While the dough chills, use a fork to lightly beat the egg whites, reserving them in a small bowl. Chop or process the walnuts into small crumbs. When you are ready to form the cookies, use a spoon or your fingers to portion out and roll 1-inch balls of dough. Dunk each ball in the egg whites, then roll in the walnuts until well coated. 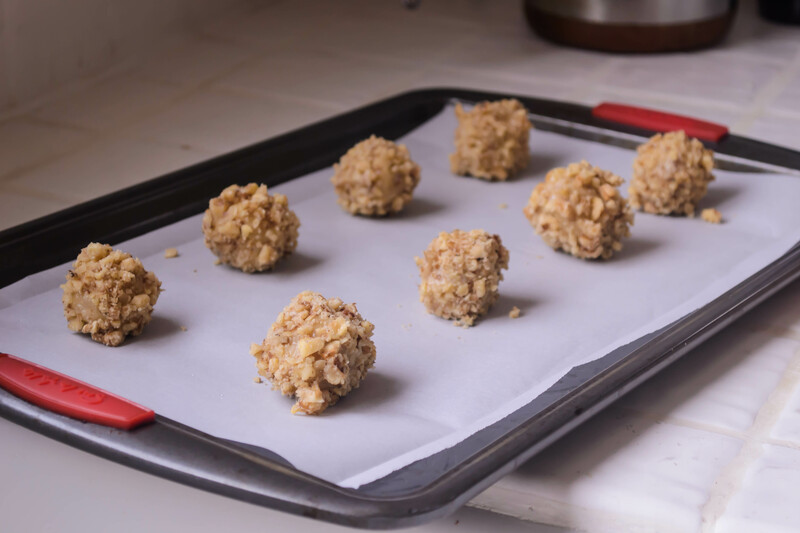 Place each ball on a greased or parchment-lined cookie sheet, spacing them about 2 inches apart. When your cookie sheet is full, use your thumb or finger to push down into the center of each cookie ball, making a depression. That’s the thumbprint! Bake at 350F for 15 minutes, until cookies are lightly golden and have swelled up. Upon removing the cookies from the oven, use the back of a spoon to lightly press down on the depressed area again, as it may have puffed up during baking. Let cool on cookie sheet for 1 minute, then remove to a wire rack. While still warm, fill the center with apricot ginger mixture – each cookie should fit about ½ a teaspoon of the fruit filling. Cookies are best cooled completely, and only get better the second day, though I suspect they won’t last much longer than that. 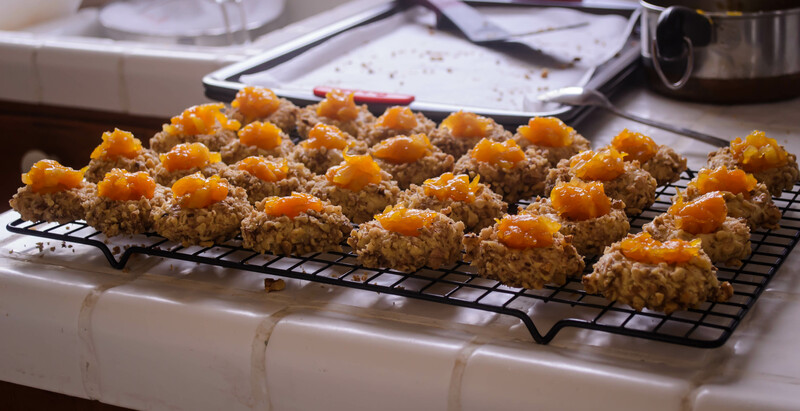 This entry was posted in Baking, Desserts, fruit, Nuts, party food, Recipes, Sweets of sin and tagged apricot, cookies, ginger, thumbprints by Chelsea. Bookmark the permalink. great read. Wish I was getting a box of Nana’s cookies this year! I am going to try these but substitute pecans due to walnut allergies. I think they would be great with pecans as well. Let me know what you guys think!